Sometimes you get smitten by an idea that almost delivers. I bought this last year and totally forgot about it until going through some photo archives. Behold the CRKT Hissatsu folder. 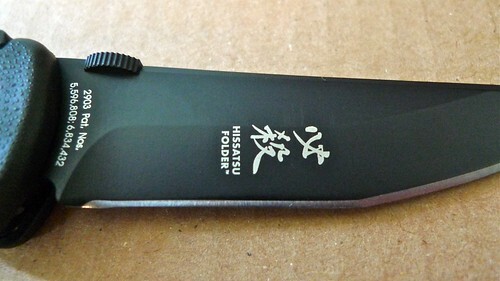 The original and variant Hissatsu fixed blades were great looking military-use blades. The thought of buying yet another nice looking fighter-fixed blade which I would never carry pushed me to look at the folding version. 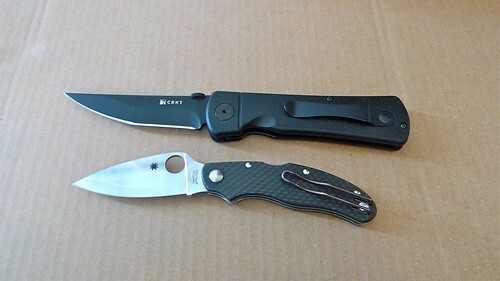 CRKT is a solid company which makes good stuff a reasonable prices. This knife is no exception… dare I say its almost too solid! 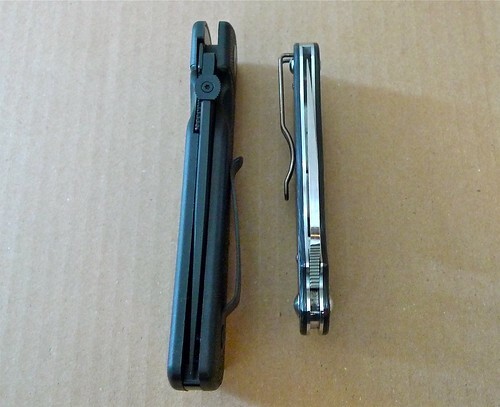 Check the width compared to my almost monogamous EDC the Caly3. I guess that’s the point, this knife is supposed to be all business. No time for fancy details. I don’t own many assisted openers, and this is my first “large” knife with such technology. The spring bar is very tight and the opening action takes a lot of pressure on the thumb stud to get the blade in motion. In my opinion, too much. I tried some tactical deployments with this monster and its just too difficult to get consistent results for me. The thumb stud is a hair too far back on the spine to afford consistently solid purchase on a rapid opening. Design wise, what we have here is a mismatch. 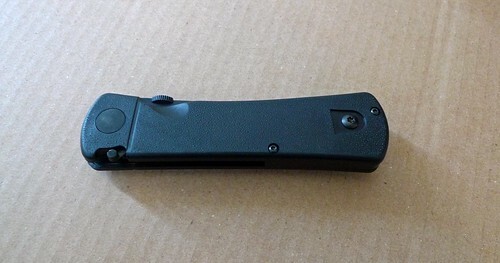 Long elegant and skinny blade shape matched to a brutish boxy handle. If you go back and look at the fixed blade version, they are evocative of samurai short swords with textured grips, pommel, and even kindof a faux menuki area. 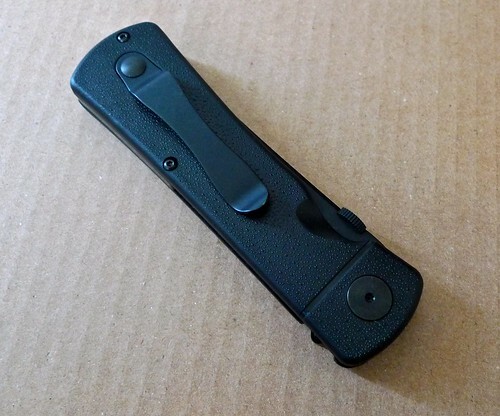 The folder has some crude texturing to imply grain on the handle, but the poor clip and shape ruin the effect. Edge wise, the knife is fine. 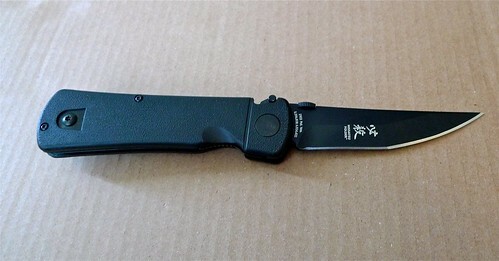 The blade shape is appealing and it was taiwan-sharp out of the box. The black coating seems done well, but alas it will not get much use as the tight deployment would frustrate the heck out of me on a daily basis. Here’s to a 2010 that finds you happy, healthy, and prosperous! 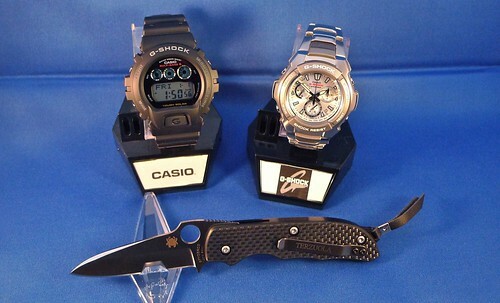 2009 ended with the solar atomic 6900 from my folks, a lovely G1000D from Mrs Rorschach, and a Spyderco Terzuola Slipit from, well, myself! Haven’t carried the slipit enough yet to review it, but its a beauty.